Ooh boy, 2016 is already sucking in terms of horror films. And what made this film so bad? Well, I’m about to go into full SPOILERS to tell you why. I know, I know, I usually try to avoid spoilers at all costs, but in order to tell you how this film screwed up royally, I will have to spoil the film’s very big twist. So be warned, if you still plan to see this film and want to form your own opinions, you might want to stop reading this review. Still here? Alright, let’s go into the setup. 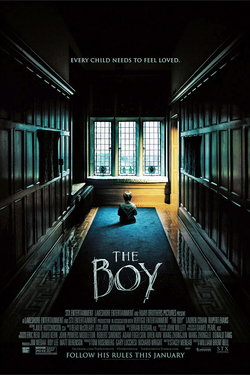 The Boy is about Greta Evans, an American running from an abusive ex, comes to England to be the nanny to an elderly couple’s son Brahms. Thing is, Brahms is a doll, the real Brahms dying in a fire over twenty years before. After the parents leave for a holiday, Greta starts thinking that the doll might actually be alive, inhabited by the soul of the psychopathic child who used to live in the house. Sounds pretty typical, right? Well they try to switch it up in the last twenty minutes. How? Well, here’s where I get spoiler-y: after Greta’s ex arrives and destroys the supposedly-alive doll, it’s actually revealed that the doll…was just a doll. Brahms, who supposedly died over twenty years ago, is actually alive, a full-grown adult who still kind-of thinks he’s a child but has adult desires, and has been living in the house’s walls and in a hidden attic for the past twenty-something years. Pardon my French, but come on! I get wanting to defy expectations, but the way it’s done here is not only a little lame, but it totally makes no sense. You’re telling me that Brahms survived the fire over twenty years ago, and that he hid in the walls, made his parents, who are apparently aware their son’s alive and in the walls and maybe holding them hostage but allows his dad to have too many drinks with the local grocery store owner, and then also made them play parents to a doll with a remarkable resemblance to him, for over twenty years? Okay, that stretches credulity. First off, the kid doesn’t mature beyond eight years old mentally, surely he’s not clever enough to come up with such an elaborate plan to hold his parents hostage! And if the parents were aware of Brahms being alive, then it argues against Brahms coming across his parents with the doll and taking advantage of the situation. Honestly, there are two ways this film could’ve actually improved itself: the first, and most obvious, is that the filmmakers could’ve stuck to the supernatural line and focused a bit more on the weird, motherly relationship between Greta and the doll. The other would’ve taken the story and focused on the parents during those first couple years after the fire, when they became aware of their son being alive and what he’s doing to them. That would’ve been an interesting story! Parents who love their son, but at the same time are terrified of him. The conflict would’ve been amazing, the thrill would’ve been powerful. And heck, if they wanted to include the doll in this version, they could’ve found an angle that would’ve worked easily. Especially if they wanted to portray the kid as not stuck mentally, but instead a growing psychopath to rival Hannibal Lecter. Other than the twist that ruins the movie, the only other problem that I have with the film is that they could’ve touched upon the weird mother-son relationship between Greta and Brahms the doll a whole lot more. That would’ve made the movie much more emotionally powerful, but unfortunately the film only explores it only a little. Other than those two criticisms though, The Boy was pretty decent. The characters are somewhat fun, the actors who play them are great, and the set is decent for a creepy movie. Heck, they even build a really creepy atmosphere punctuated with jump scares. I was afraid at times, and for a little while I really thought the film entertaining, if not downright terrifying. It’s just that twist. Even if it didn’t make absolutely no sense, it’s so lame it ruins the entire film. Which is why I’m giving The Boy a 2.8 out of 5. Great atmosphere and characters, a promising premise, but I’d only recommend this film if you want to see how a horror film can totally ruin itself by trying to defy expectations, and doing it in the worst way possible. Okay, I had to skip this to avoid spoilers :p But given your rating I think I’ll netflix this one too, LOL! If you want to. I feel it’s a waste of time, but hey, maybe you can watch it to make fun of it (I did the same thing with that Peter Pan Live thing on NBC a few years back). That can be fun! Lol! I agree completely. It was going good until ” the twist.” Then I was just confused as it didn’t make any sense and all the suspense was then gone. It was a let down for me. I would have been okay with it if maybe Brahms had posessed his charred corpse or something, but this twist stretched logic to say the least. I sometimes wonder if the people who read scripts and give the green light for bad movies happen to be the filmmakers’ mothers. It might explain why nobody ever brings up criticisms like this before the film is even made.